In this video, Chinese people wildly kills Uyghurs. They use big stones and rocks to crack their heads, skulls and everywhere of their body. 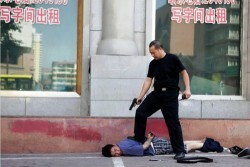 Chinese are doing this everyday to Uyghurs. As you see in the video, they continue hitting the Uyghurs even if they are already unconscious. While they are killing Uyghurs, other Chinese people watch them and do nothing to help Uyghurs and rescue them.